I’ve read John Green before: some years ago I read Looking for Alaska (currently my favorite of all his books), and then Paper Towns after that. Both were worthwhile reads, and when people ask me for YA recommendations, I would usually point to those two books, among others. I have a copy of his other work, An Abundance of Katherines, on my shelf, but haven’t had time (or inspiration) to read it yet. And then he comes out with this new book in 2012, The Fault in our Stars, about two teenagers and the Big C.
Hmm. Is this a John Green-ed version of A Walk To Remember? It would take me two years before getting an answer. 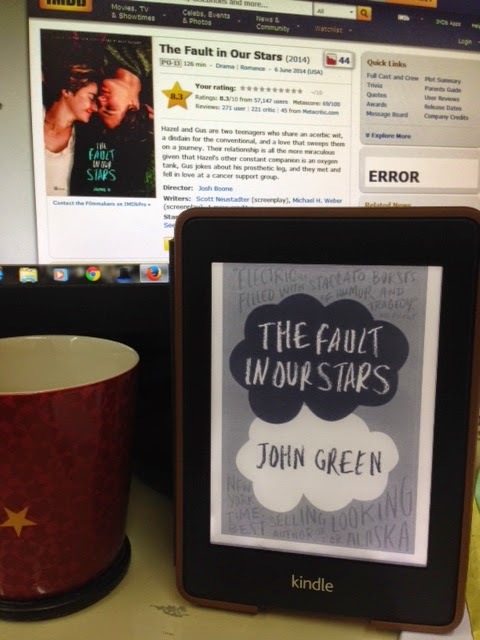 The Fault in our Stars is about Hazel Grace Lancaster, 16, diagnosed with thyroid cancer, and Augustus “Gus” Waters, 17, on remission from osteosarcoma, or simply, bone cancer. They meet at a cancer support group meeting that Hazel Grace attends, become friends (of course), gradually spend time together, and thereafter, embark on a short, bittersweet journey to find young, sweet love – one that transcends sickness and death. Almost all the reviews I’ve read about this book said it was a tearjerker, that you won’t be able to keep from shedding a tear or two while reading it. Of course, when one of your principal characters is afflicted with cancer, it’s only reasonable to expect that at some point, there will be something in the story that will plunge a dagger through your heart or affect you so much that it will make you cry. Well, in The Fault in our Stars, both Hazel Grace and Gus are diagnosed with cancer, so I prepared myself for one of these endings (really, is there any other possible ending? ): Hazel Grace dies, or Gus dies. Either tragic way, you deal with it. The friendship that blossomed between Gus and Hazel Grace stemmed from their common love for books. Hazel Grace’s favorite author was the (alcoholic) Peter Van Houten, who never reads his fan mail (which included Hazel Grace’s). Gus borrowed Hazel Grace’s copy of Van Houten’s book, An Imperial Affliction, and was instantly hooked. When a rare opportunity to meet Van Houten is presented before them, they take it, and it was then that their story really began. "I am," he said. He was staring at me, and I could see the corners of his eyes crinkling. "I'm in love with you, and I'm not in the business of denying myself the simple pleasure of saying true things. I'm in love with you, and I know that love is just a shout into the void, and that oblivion is inevitable, and that we're all doomed and that there will come a day when all our labor has been returned to dust, and I know the sun will swallow the only earth we'll ever have, and I am in love with you." I loved Gus. I would have loved to have met someone like him when I was a teenager: he was sweet, caring, and selfless. I would have died of fluff and feels and sheer happiness from all those things that he did for Hazel Grace. Indeed, he is the perfect boyfriend – save for the fact that being involved with him is like Damocles’ sword hanging over my head all the time. He and Hazel Grace are both smart, mature kids who have so much to offer the world, but whose lives are threatened to be cut short by disease. And it’s not because they are kids that their situation is worse than, say, older people who have had the chance to live their lives before they were crippled by disease. It’s because the cancer is real, the imminent threat to life is real, and the pain is real – both for the dying and the family they will leave behind. The plot and themes of The Fault in our Stars are tragic, indeed, even if you find yourself unable to relate to any of the characters because you haven’t met or don’t know anyone diagnosed with cancer. But you don't need to be able to relate to conclude that their story is a sad one. Some may call Hazel Grace and Gus pretentious, some may find the plot cringe-worthy, but the fact that there are Hazel Graces and Guses out there cannot be denied. "All salvation is temporary," Augustus shot back. "I bought them a minute. Maybe that's the minute that buys them an hour, which is the hour that buys them a year. No one's gonna buy them forever, Hazel Grace, but my life bought them a minute. And that's not nothing." And I did get teary-eyed somewhere there. Once or twice. I want to read this, only bf and me decided to watch this but it didn't happen. I'm scared to read book reviews because of spoilers and the possibility that I might not read it after. I still want to read this, I like reading books that has film adaptations. This is a nice book. I would understand why people will cry for it or why people will hate it. I did neither, but it doesn't make it bad.